I started off a little skeptical about adopting a horse. After all, owning a horse is a very big responsibility and I had several goals for a new horse. 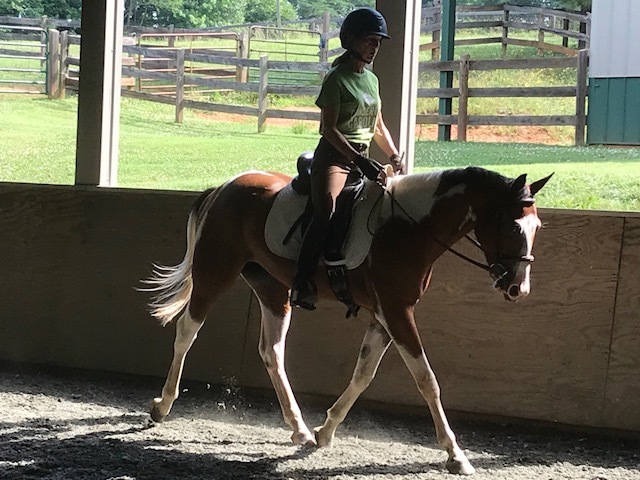 I wanted the new horse to be easy enough for my husband and grandchildren but interesting enough for me to enjoy for trail riding, hunter pace events, and some dressage and jumping. When it was time to let my two old horses go (they were both with me for over 30 years), I decided to at least look into what HERD had available. That was one the best decisions I have ever made as we ended up with a really wonderful horse who is well on his way to meeting all of my goals. I soon realized that HERD is a very special organization. HERD horses are beautifully handled and get excellent health care. Once I told Heather Freeman of HERD what I wanted and what my experience was, she showed me the wonderful guy I ended up with: General Morgan. He was just three and not yet backed. I told Heather that I wanted to know that he could be ridden and she immediately arranged to have him started by Demetrios Alvarez. Demetrio did a wonderful job and my smart sweet horse just seemed to love having a fun job to do. I took over the training after just nine sessions with Demetrios and while I am very careful to keep everything slow and short, I have been trying to expose Danny to lots of new situations. I have trailered him to a friends farm for short trail rides with a wonderful older gelding. I ride him on the trails at my farm. Bridges, streams, logs are just fun for Danny. He is so gentle that I have taken my son, husband and grandson on short trail rides--they ride Danny and I ride my mare. As if all that is not enough, Danny is a pretty nice mover and really fun to ride. He learns so quickly and he just seems to love doing things with people. We just love this little horse. The wonderful handling that Danny had while he was with HERD almost certainly has a lot to do with his great attitude. Heather made it clear from the start that Danny would be welcomed back at HERD if he did not suit our situation but we knew after just a few days that he would be a permanent part of our family.